I read it a different way. It’s a twofold problem. First they’re trying to prevent the past from being changed so she can’t take any aggressive action because it might change the past and second she’s with two POC who are actively in a danger, any aggressive action she takes who only further endanger them. I don’t disagree with that (and if my post comes across contrary to your point I misworded it, I’m definitely on-board for that interpretation), there’s a definite feeling in the episode that the mechanism of society is strongly against The Doctor and her companions. The early scene where Ryan gets slapped, when they’re in the diner and then in the motel there’s a big feeling that every last one of them could easily be lynched and nobody would bat an eyelid. Sometimes in that position the only defiance you can offer is a comment with a double meaning. My market research told me that people never do what I ask them. I’m really impressed with Bradley Walsh, I was dreading him being added to the cast but he’s totally won me over. The look he gave when he realised that he was the person Rosa was going to have to give up her seat for was a very good bit of acting and the line delivery was perfect. The new ep was good but very clunky but I’m all for evil greasers as bad guys. I agree, that moment was my favourite bit. He sold it wonderfully I thought. He’s a really solid actor, his character isn’t like Bradley Walsh at all. I could see him laughing at The Chase on a chair with a cuppa and wondering how someone could be so quick-witted. I tried to stay open-minded on Walsh ahead of the series - I had heard good things about him on Law & Order, but you never know how easily a well-known personality like him will be able to disappear into a role. But like Tate, he’s done really well and has been one of the best new additions to the show. 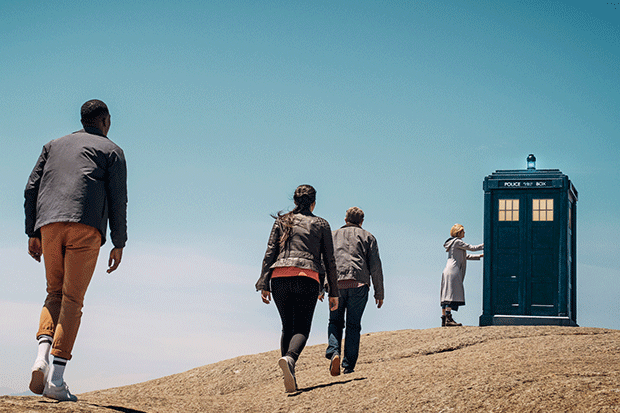 How would YOU write down the noise of the Doctor's time-travelling spacecraft? I know Vworp is the classic sound effect and everything, but it’s never felt like a great example of onomatopoeia to me. The Tardis makes more of a screech than a Vworp (although I always like that old description of it being a wheezing, groaning sound). Well it is an incredibly scary clip. I think the group is well thought out, creating a good ‘family’ unit, rather than a Scooby Gang or Holmes and Watson. With the Doctor as the Parent, plus two squabbling (but basically good) kids, and Grandad as a backstop. Still haven’t seen the new episodes, but this looks very much like she’s also channelling Tennant’s performance a bit. Nice nod, if that is what she’s doing. but this looks very much like she’s also channelling Tennant’s performance a bit. I think it’s just that Chibnall is writing Tennant dialogue for her, so she’s got no other real choice. Nah, you could still deliver those lines in a hundred ways, but this was exactly Tennant’s Doctor. I’m not really getting that from her performance. I didn’t like Tennant at all and am enjoying Whittaker quite a bit. I find it interesting that they’re writing her as much more fallible and not all-knowing as the doctor typically is. I’m just talking about the little bit there in the clip, not about her general performance, mind you.